Homeward Bound the latest creation by the artist Anthony Cowland G.Av.A. 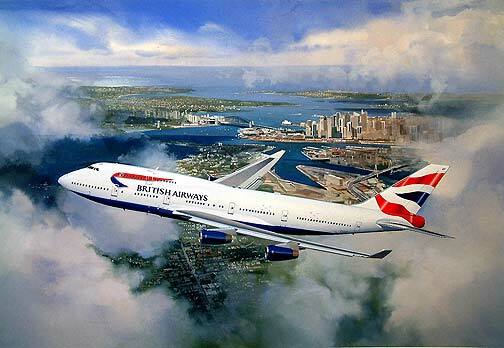 features British Airways Boeing 747-436 G-CIVT as she makes a climbing turn away from Sydney International Airport. An outstanding view for passengers on the right hand side of the aircraft as the whole of down town Sydney can be seen. A real treat before settling down for the long haul back to London. A superb limited edition print from the original painting of the same name. Released as a limited edition print of just 250 with an image size of 40cm by 29cm. PLEASE NOTE WE SOMETIMES HAVE SECONDARY MARKET MINT CONDITION COPIES OF THIS PRINT! THEY ARE, HOWEVER SLIGHTLY MORE EXPENSIVE DUE TO THE ORIGINAL PRINT RUN OF 250 SELLING OUT!, DO CONTACT US IF YOU ARE INTERESTED IN OBTAINING A COPY OF THIS MUCH SOUGHT AFTER AND CLASSIC PRINT?